And think how much more our obese nation actually eats, but doesn't need. All told, 80% of our food is wasted. The biggest waste of food I personally witnessed was at hospitals, assisted living & nursing homes, where whole plates of food are often thrown out. Agree 100%. Everyday, everywhere, all around the country. When I bagged groceries as a kid, the bakery would throw all it's fresh breads and patries away at the end of each day. I asked why they can't be taken home by the employee's or donated. I was told that it would encourage employee's to 'hide' or otherwise not sell items that they wanted to keep for themselves. Basically they thought we were all theives and don't trust their employee's. This was Balducci's, formerly Sutton Place Gourmet, in Alexandria, VA. What a waste!!! Well we can afford to waste whatever we like. We grow this food after all and we can hog it (literally if you have seen those contests) or waste it. Why make an issue of it? let millions around the world go hungry its their problem.They should grow their own food and more. Try shopping at grocery outlet style stores. 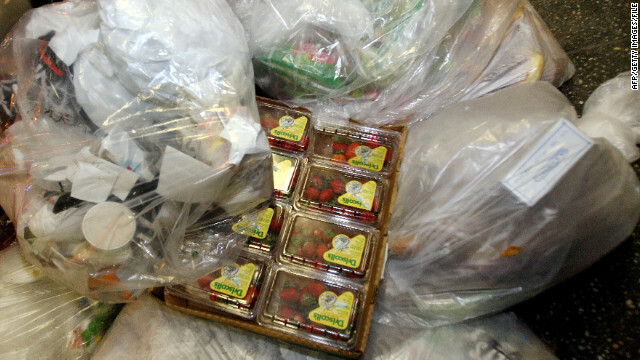 These discount store often have great deals on fresh food that needs to be sold or thrown away. The discount store may not have evrything you need but it is worth it to stop by them first. Just stay out of the frozen section. People interested in this should check out 'The Big Waste' where Food Network chefs went around to grocery stores and only used the food that would be disposed of to create meals. It was interesting and enlightening. "•Stores overstock displays of fresh produce to give an impression of bounty" – Definition of First World problem. Yet the # of Americans needing food assistance is streadily increasing. Knowing this is the case it seems to me that there should be the ability for food to be distributed to those that need it. Secondly, food sits on store shelves for a reason, a large amount of Americans can not afford it. So why are we wasting food again, although marked the wealthiest nation on earth, there is a pretty serious problem right here at home. I feel very thankfull right now for getting three square a day while so much is wasted while so many go hungry. It is a sad state of affairs also when a farmer can not make a profit of a food crop. We need to somehow export this excess. I am single and this most certainly doesn't apply to me. Try 1% per month if that. Does this count the food that liberals eat? Does this count all the food that conservatives eat? I thought conservatives only ate babies. Considering the price of beef and some other food items, I often wonder how much stores throw out simply because shoppers refuse to pay that much and the product spoils. If stores would rather throw it out than discount it until it sells, the only motive I can think of is greed. A local deli/bakery gives the loaves of bread it didn't sell the day before to a local homeless shelter every day. That's one thing most grocery stores could do if they don't do it already. It is a waste of God's blessings. So many people are poor and hungry in USA and so many are dying in the world for lack of food yet we are wasting food here. What a pity !!! Maybe the world simply needs a Walmart. It's interesting that when you go to a food shelf most of the people getting food are obese. What up with that?